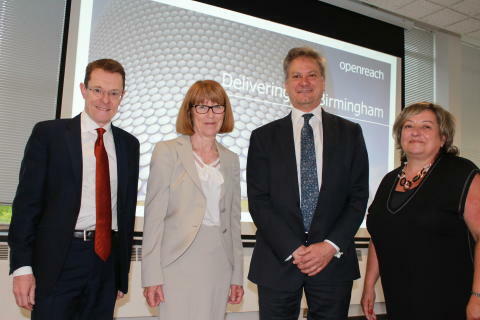 Work to connect Birmingham up to ultrafast broadband as part of Openreach’s ‘Fibre First’ programme is well underway – with the first 100 homes and businesses now able to access speeds of up to 1Gbps – chief executive, Clive Selley, announced during a visit to the city. The roll-out is part of the national digital infrastructure provider Openreach’s plans to make Fibre-to-the-Premises technology available to three million homes and businesses across the UK by 2020. The 100 homes – located in Great Barr and Kings Norton – are the first to be ‘switched on’ as part of the phased initial roll-out, with building work due to be completed by the end of June, enabling thousands more homes to access the new technology. Engineers are carrying out further planning and survey work in additional parts of the city, including Sutton Coldfield and Streetly, with Acocks Green and Stechford to follow. Details of the roll-out were given by Clive Selley during a breakfast meeting for business and civic leaders, academics and representatives of other key organisations, hosted by Greater Birmingham Chambers of Commerce. Clive said: “Birmingham is seeing an incredible transformation and we’re proud to be playing our part in that. Our roll-out of ultrafast broadband has been planned specifically to support important local projects like preparations for the 2022 Commonwealth Games, expansion of the Midland Metro tram network and new housing projects, as well as focussing on areas of the city with the slowest broadband speeds. “Ultrafast fibre broadband will help create wealth, spread opportunity and drive exciting new developments in sectors from health to transport and finance. Clive also confirmed Birmingham had been chosen by Openreach to pilot two important broadband projects. The first – in Sutton Coldfield and Streetly - is looking at new ways of speeding up the delivery of Fibre to the Premises (FTTP) technology; and the second – in Moseley - aims to simplify the way ultrafast broadband is installed in apartment blocks, to minimise disruption to residents. The developments have been welcomed by Andy Street, Mayor of the West Midlands. Andy said: “We are thrilled that Birmingham will be a beneficiary of investment in digital infrastructure by Openreach, and this event has been a fantastic opportunity for regional stakeholders and businesses to discuss how we can make the most of ultrafast ‘full fibre’ broadband and other digital networks that will shape this city’s future. “The building of this new digital infrastructure is expected to boost economic growth and employment, supporting key sectors across the city. In my Digital Plan for the West Midlands, digital technologies and the associated infrastructure will help enable and optimise the region, which will be vital to the continued success of the regional economy. Paul Faulkner, chief executive, Greater Birmingham Chambers of Commerce, said: “It is brilliant news that Openreach have selected Birmingham as one of the first cities in the UK to experience fibre first broadband. Digital connectivity is crucial for businesses in this modern era. “Openreach’s world-leading digital infrastructure will boost the city’s standing as a national hub for innovation, and the Greater Birmingham Chambers are proud to be facilitating discussions between stakeholders and businesses to explore how we can maximise the potential of this investment for the regional economy. Earlier this year Openreach announced it is hiring more than 200 new trainee engineers across the region to help deliver ultrafast broadband. Birmingham already has access to extensive high-speed broadband, with more than 96 per cent of city premises now able to connect to 30Mbps and over*. For more information please contact Emma Tennant at Openreach on 0800 085 0660 or the Openreach PR team on: 020 7809 7950 or email press@openreach.co.uk.